Whether or not you have children, odds are you at least know a child. According to the latest United States Census data on Households & Families in Maryland, from 2000, the percentage of households with children under age 18 in United States homes is 32.8. This percentage is higher in the state of Maryland, with 33.4 percent of households having children. 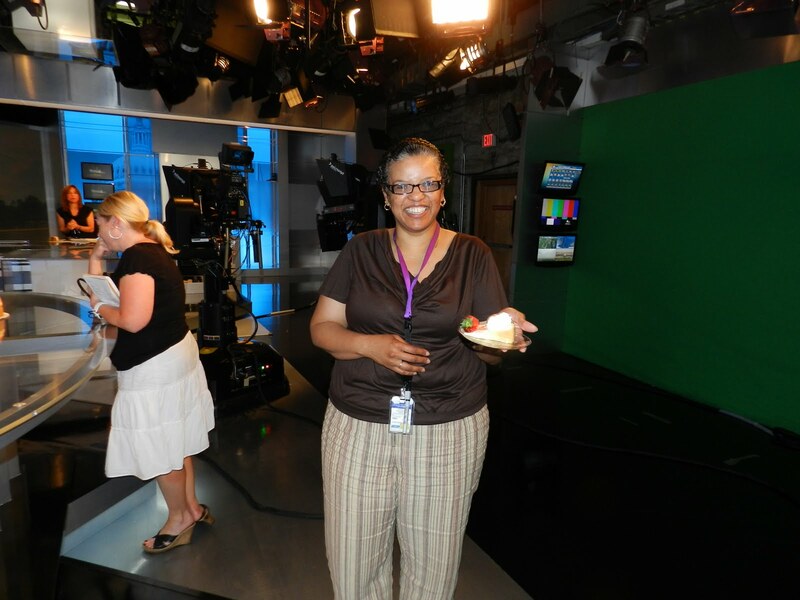 It is even higher in Prince George’s County, where 35.3 percent of households have children. Upon learning of the large number of children in Prince George’s County, it makes you realize how important child safety is—especially in vehicles. According to safekids.org, “motor vehicle crashes are the leading cause of death among children between the ages of 3-14.” Stopping children from riding in vehicles obviously is not the solution. The answer is to utilize proper prevention methods and child safety procedures, in order to decrease the chances of child injury or death while in a vehicle. Studies from safekids.org show that approximately 73 percent of child restraints are not installed or used correctly. Further, about half of the children aged 14 and under who do die in a car accident were completely unrestrained. But this is quickly counter-acted by the fact that properly used child seats and restraints can reduce the risk of death by as much as 71 percent. If you are unsure that you are correctly using your child’s safety seat, Safe Kids hosts car seat checkup events. They have mobile car seat checkup vans, as well as inspection stations where you can visit to make sure you are properly protecting your child from injury. Studies found on safekids.org also show that children are 40 percent safer when riding in the back seat of a vehicle, as compared to riding in the front seat. The odds of injury drop to less than 2 percent when children riding in the back seat are also using restraints, e.g. seat belt or car seat. Remember, children are to be at least 2 years of age and weigh 30 pounds before transitioning from a rear facing to a forward facing car seat. The American Academy of Pediatrics and the state of Maryland have accepted this as best practices. Also, children must be 4 feet 9 inches tall and weigh between 80-100 pounds before graduating from a car seat to a booster seat; and there is a five-step seat belt test before graduating to a seat belt position. Children are our future, keep them protected and drive safe to ensure their future. A review of Maryland laws can be found at http://www.mdkiss.org/. For further information you may contact Ms. Teresa Crisman, Fire/EMS Department Community Outreach Coordinator, at 301-883-5250, or visit one of the locations from the attached list. 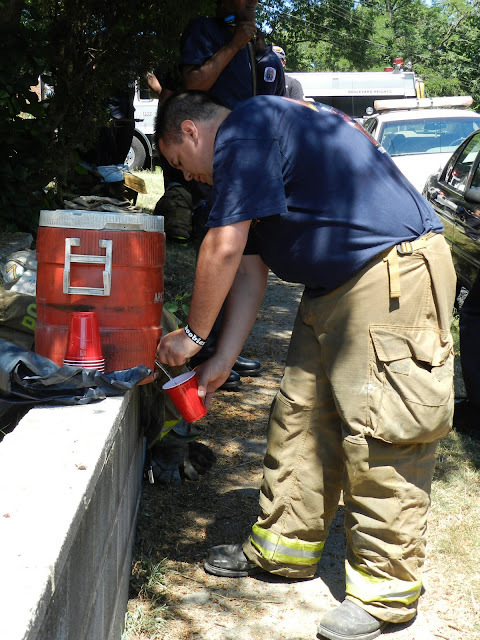 Firefighters are accustomed to operating in "hot" conditions. However, when air temperatures and quality become dangerous and unhealthy, injuries and illnesses to emergency personnel become likely and preventative measure are required. 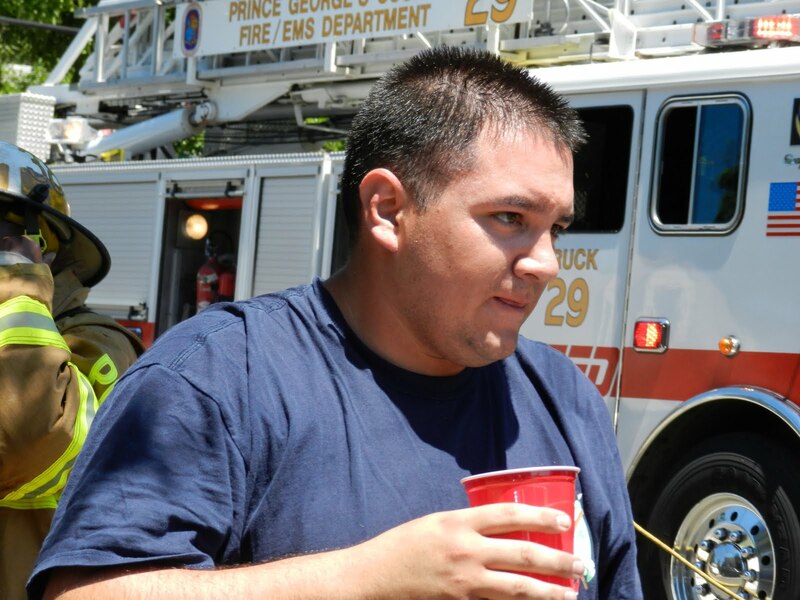 For example, a firefighter was admitted to a local hospital on Monday, July 25, suffering a heat related illness after battling a Hyattsville house fire. Firefighters battled a fire in a vacant home on Wednesday morning in Boulevard Heights. At about 11:45 am Fire/EMS units were alerted to a house fire in the 4200 block of Byers Street and arrived to find a 2-story structure with fire showing from a basement with extension into the 1st floor. The cause of the fire is under investigations and fire loss estimates are still being considered. In addition to battling the fire, firefighters also had to deal with “pack-rat” conditions throughout the house. There were about 30 firefighters and paramedics on the scene. 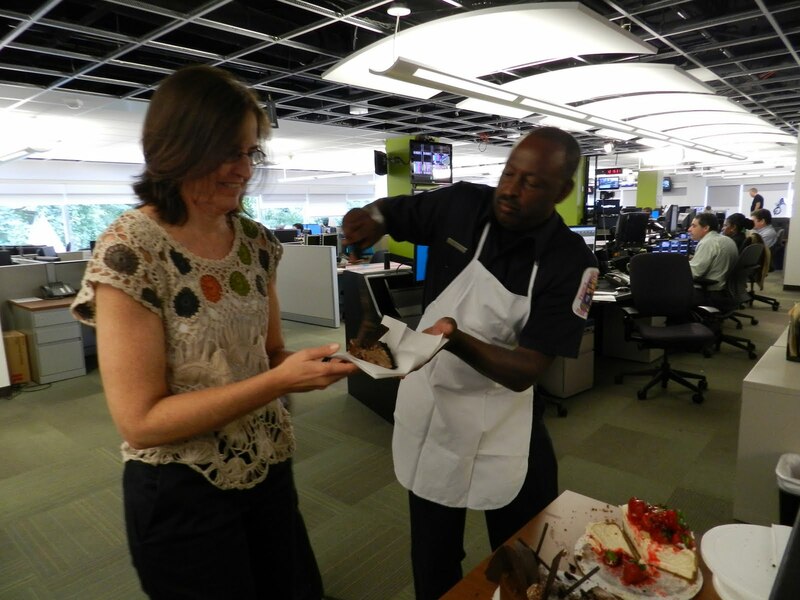 It required about 15 minutes to extinguish the fire. The Fire/EMS Department is currently operating under a “Heat Stress Watch” in which heat related illnesses to firefighters are possible. 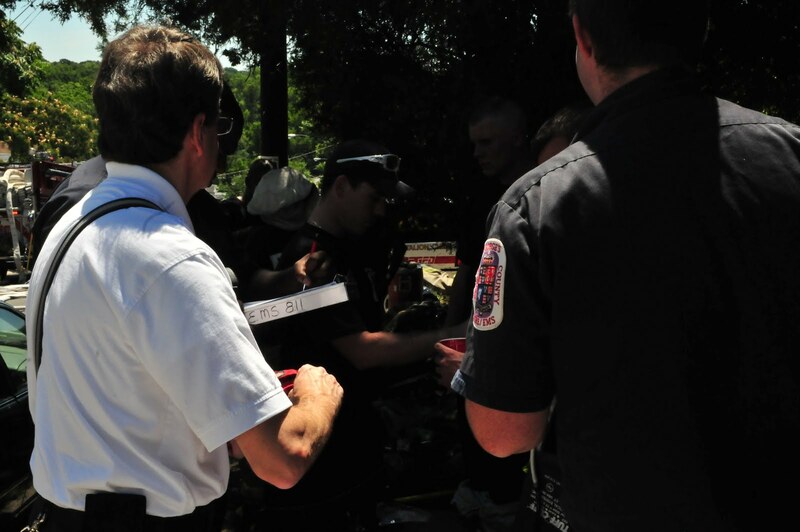 To prevent against the illness and injuries firefighters are required to go through a “rehab” area after battling a fire or other strenuous activity. During rehab firefighters rehydrate themselves and have vital signs monitored by paramedics. Once the cooling process is complete and vital signs are within normal limits, firefighters are cleared to perform additional duty. The Prince George’s County Fire/EMS Department issues a heat stress watch or heat stress warning when heat conditions present a safety hazard to personnel involved in emergency operations. Incident Commanders and Unit Officers are encouraged to take appropriate steps to monitor and protect their crews during these conditions. 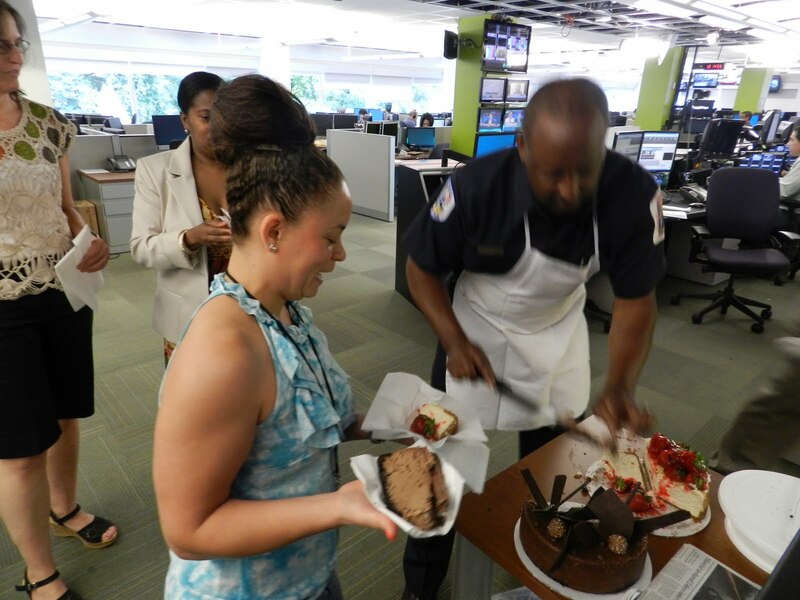 The Fire/EMS Department takes the safety and wellness of our personnel very seriously. Constant reminders are broadcast over the radio system during the course of the day while operating under heat stress watches and warnings. 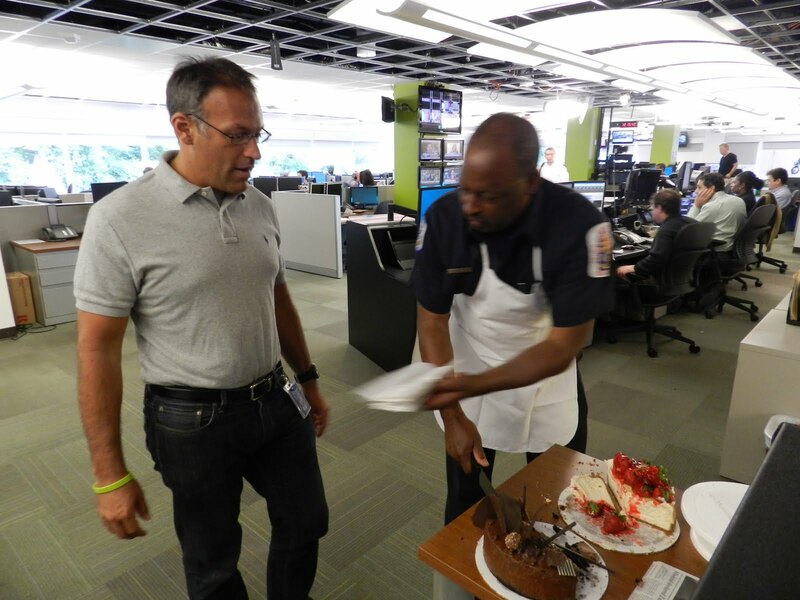 Members of the Fire/EMS Department take these steps to stay healthy. By firefighters taking necessary precautions and following prescribed guidelines before, during and after periods of intense work in high heat conditions is keeping Safety First to Ensure Everyone Goes Home. 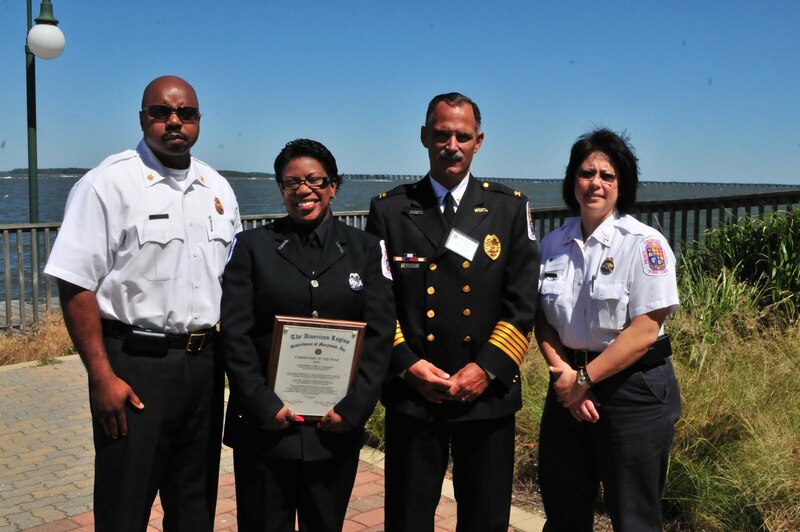 The U.S. Fire Administration (USFA) and the Prince George’s County Fire/EMS Department (PGFD) are pleased to announce a new partnership with the National Association of Town Watch (NATW), which administers National Night Out (NNO). 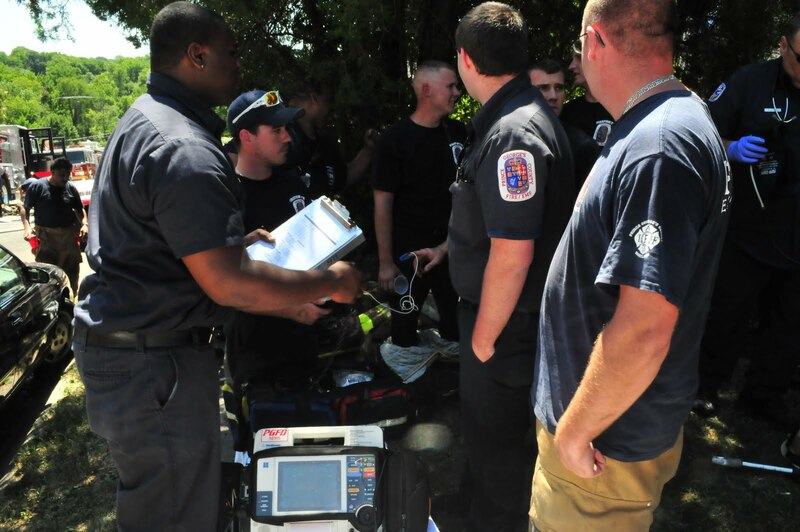 USFA and PGFD are working with NATW to enhance NNO events and activities by reaching out to fire and emergency medical service (EMS) personnel across the country. The goal is to promote fire and life safety prevention and education initiatives for families and communities while partnering with law enforcement. National Night Out is Tuesday, August 2, 2011 and it is projected to reach 37 million people in 15,000 communities in all 50 states, U.S. territories, Canada, and military bases throughout the U.S. and around the world. Fire departments and EMS can help expand community partnerships by participating in NNO events and activities to share fire and life safety prevention information. Prince George’s County Firefighters, EMT’s and Paramedics will join our public safety partners during the National Night Out to promote fire safety and injury prevention. 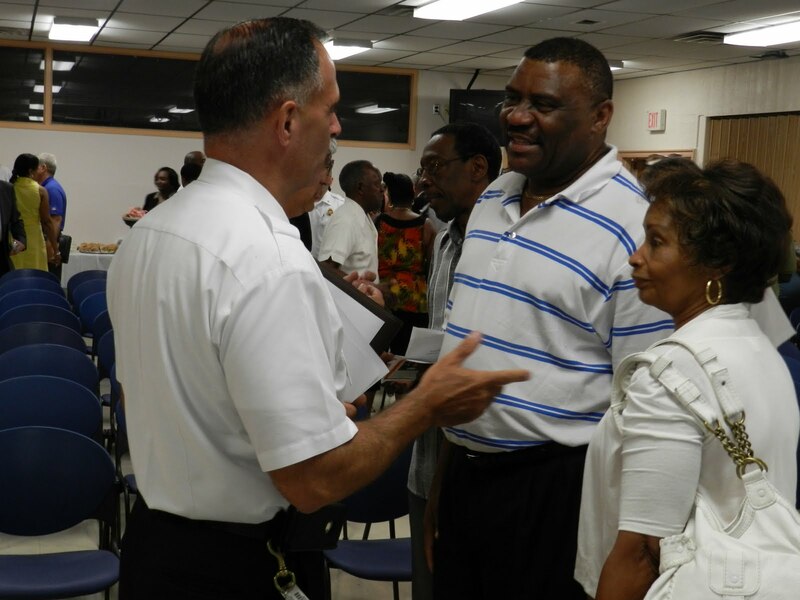 Prince George’s County Fire Chief Marc Bashoor will be joined by career, volunteer and civilian members of the Fire/EMS Department to visit as many National Night Out events as possible. 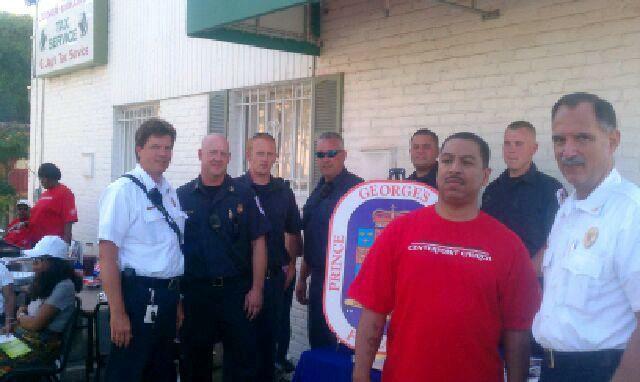 Prince George’s County Fire Chief Marc S. Bashoor and Firefighter/Medics from the 3rd Battalion recently joined with members of the Temple Hills and Hillcrest Heights area on a cook-out and walk. 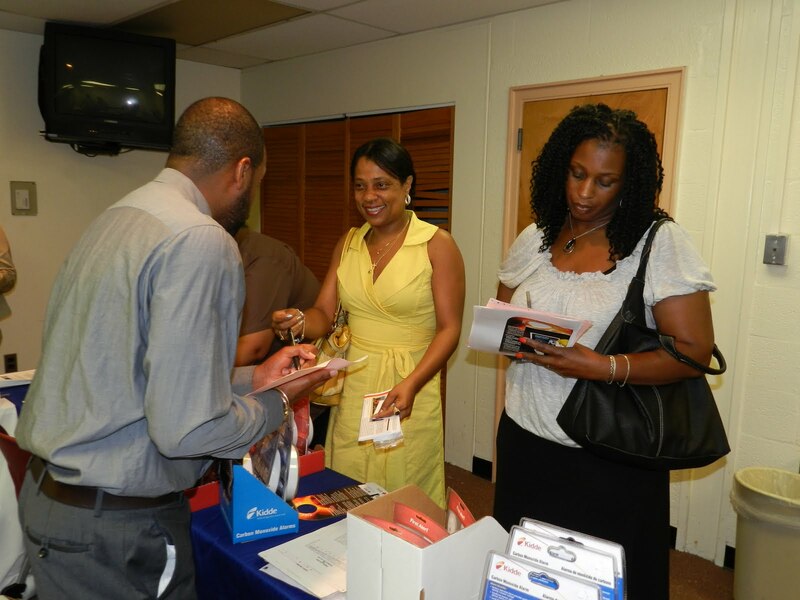 On Wednesday, July 27, 2011, Chief Bashoor and staff attended the community event at the invitation of Reverend Orlando J. Bego, Pastor, Centerpoint Church. The Fire/EMS Department provided an area with community outreach materials including smoke alarms, fire safety and injury prevention materials. Participants gathered in the 3000 block of Saint Claire Drive in Temple Hills for a cook-out and then walked together throughout the community. A Hyattsville family safely escaped their burning home early this morning. On Monday, July 25, 2011, just after 3:00 am Public Safety Communications received a 911 report of a house fire in the 5500 block of 43rd Place. The caller advised 911 call takers that the rear deck was on fire. Fire/EMS units arrived on the scene reporting fire on all 3 floors, rear side, with extension to the house next door. Due to the balloon frame construction of the house and high heat conditions the Incident Commander, requested a second alarm. These resources would ensure a rotation of personnel through a rehab and hydration area in between periods of work. One firefighter was transported to a local hospital suffering from heat related issues. Fire Investigators estimated fire loss at approximately $200,000 in damages ($150,000 Structures/$50,000 Contents). The cause was determined to be accidental as a result of a charcoal grill that was just hours before. The County Citizen Services Unit and the Red Cross are assisting the displaced family. A crash on the Beltway this morning involved a civilian vehicle and a paramedic unit that was transporting a patient to the hospital. 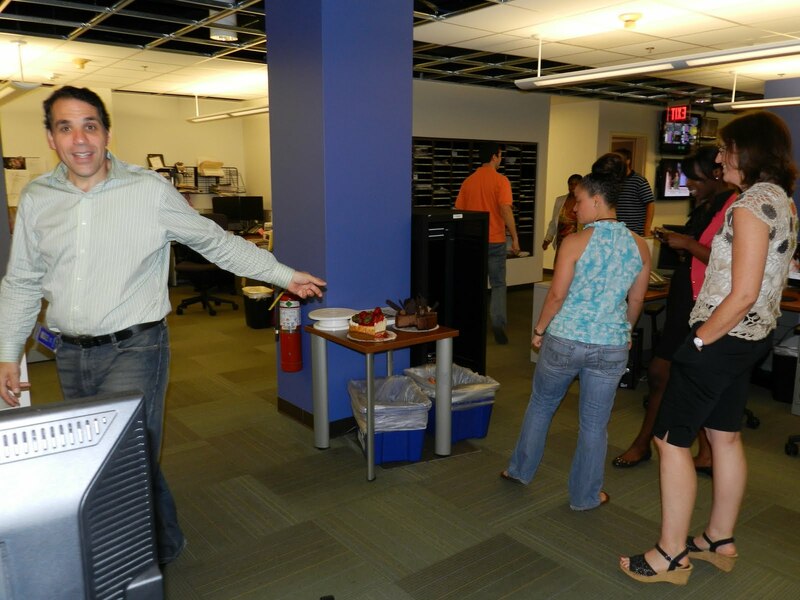 The incident occurred just before 12:30 am, Thursday, July 21, 2011, on the Beltway near Branch Avenue. Medic 826, from the District Heights Fire/EMS Station, was transporting a patient to a hospital when a civilian vehicle forced them off the road and into a guardrail. 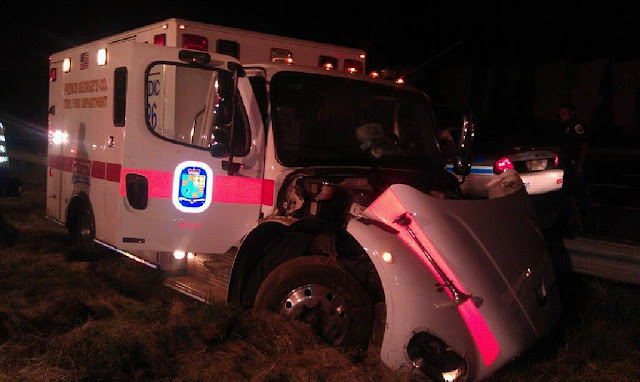 The crash injured the two Firefighter/Medics, 2 civilians and caused significant damage to the paramedic unit. Additional Fire/EMS units responded to the scene and completed the transport of the original patient on board the medic unit to the hospital. The original patient did not appear to have suffered any injuries as a result of the crash. The four patients injured in the crash were transported to area hospitals for their non-life threatening injuries. The two career Firefighter/Medics were transported to a Trauma Center, treated and released. The paramedic unit sustained damages estimated at $100,000 and could be a total loss. 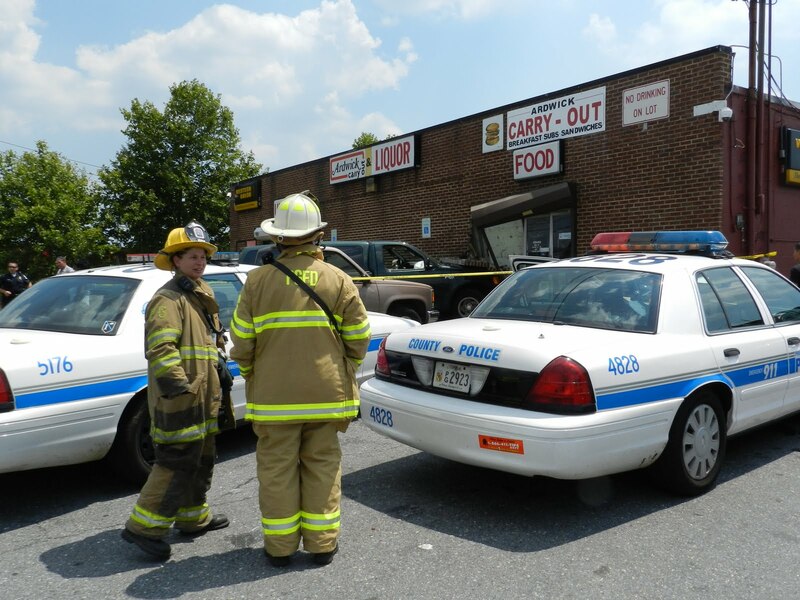 The Prince George’s County Police Department is investigating the crash. Every day you whisper a promise to your child, "I’ll always keep you safe." But keeping your home and children safe takes more than a promise. It can only be done with planning and preventive action. The danger of falls and fire may be greater than you think! Preventing falls from windows is as important as learning how to use one in an emergency. Unattended children run the greatest risk of fall and injury, so your best 'first step' is to watch children as they play. 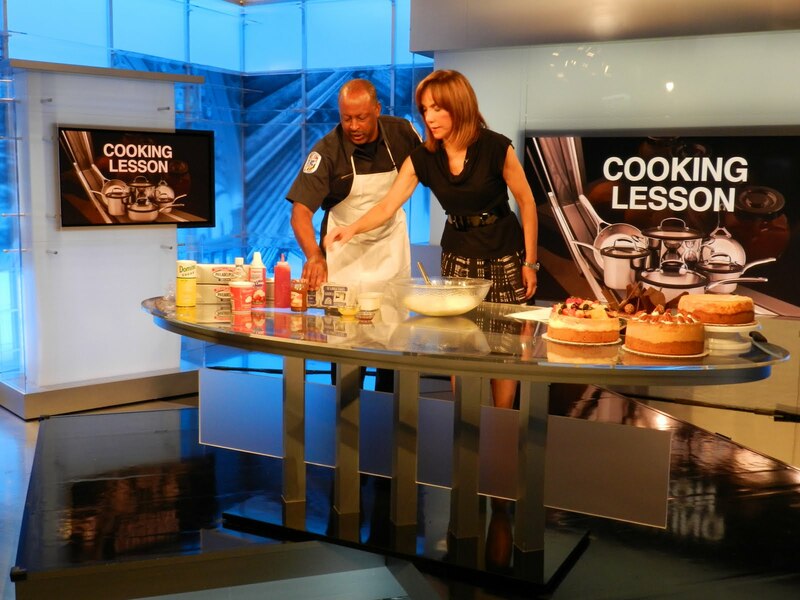 Nothing can substitute for careful supervision. Fire is frightening. All too often, the bodies of young children are found after a fire in places where they tried to hide. Teach your children that they can’t hide from fire: They must escape it! Decide on at least two emergency escape routes from your home. Windows provide one of the fastest, easiest alternative ways out of a burning residence. Teach children how to safely escape through windows and take time to practice with them. Every family member should know how to operate the windows used for fire emergencies. Delay in escaping fire can cost lives and increase injury. Often paint, dirt or weathering will seal a window shut. Make sure yours open easily from the inside and are not blocked by furniture or other objects. Remember also that security bars, grilles and grates not only keep intruders out; they can also lock you in. The same holds true for window guards. Everyone should be able to get out through a window at all times without using tools, keys, special knowledge or significant effort. When youngsters are around, close and latch your windows. If you need ventilation, only open windows they cannot reach. Be sure to keep furniture - or anything children can climb - away from windows. And teach your children not to play near windows. And finally, never depend on insect screens to prevent falls. Insect screens are designed only to provide ventilation. They will not support the weight of a child or prevent their fall. 1. Windows provide a secondary means of escape from a burning home. Determine your family's emergency escape plan and practice it. Remember that children may have to rely on a window to escape in a fire. Help them learn to safely use a window under these circumstances. 2. When performing household repairs, make sure windows are not painted or nailed shut. You must be able to open them to escape in an emergency. 3. Keep your windows closed and latched when children are around. When opening windows for ventilation, open windows that a child cannot reach. 4. Set and enforce rules about keeping children's play away from windows or patio doors. Falling through the glass can be fatal or cause serious injury. 5. Keep furniture — or anything children can climb — away from windows. Children may use such objects as a climbing aid. officials to determine proper window guard placement. 7. Some homes have window guards, security bars, grilles or grates covering windows. Those windows can be useless in an emergency if they do not have a functioning release mechanism. Test them today because time is critical when escaping a fire. 8. Do not install window unit air conditioners in windows that may be needed for escape or rescue in an emergency. The air conditioning unit could block or impede escape through the window. Always be sure that you have at least one window in each sleeping and living area that meets escape and rescue requirements. 9. The degree of injury sustained from a window fall can be affected by the surface on which the victim falls. Shrubs and soft edging like wood chips or grass beneath windows may lessen the impact if a fall does occur. Can our Community Firefighter/Medics count on you? Along with surveying your home, school and workplace today, please help us by sharing this informative brochure and checklist throughout your community. 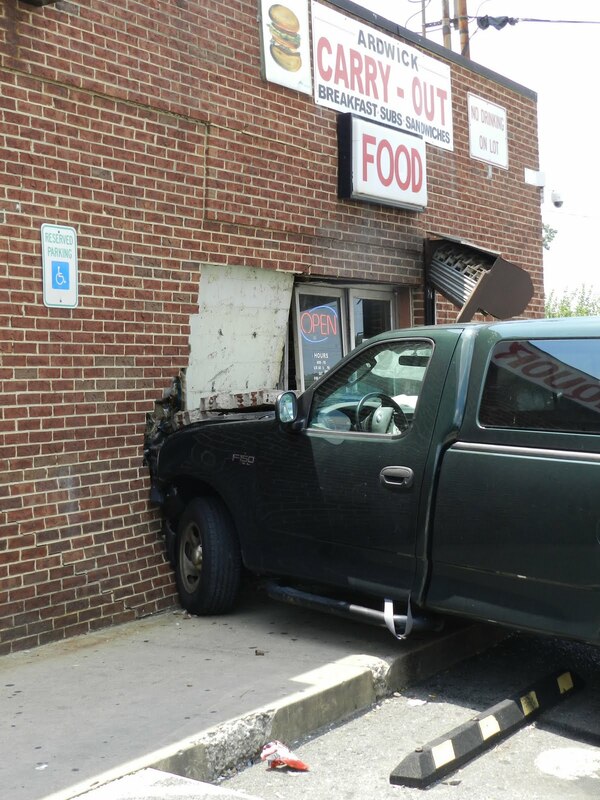 A pick-up truck slammed into the front wall of a carryout this afternoon causing moderate damage and required two stores to close. According to witnesses, at about 1:45 pm, an adult female driver of the truck appears to have suffered some type of mild medical emergency causing her to lose control of her vehicle. 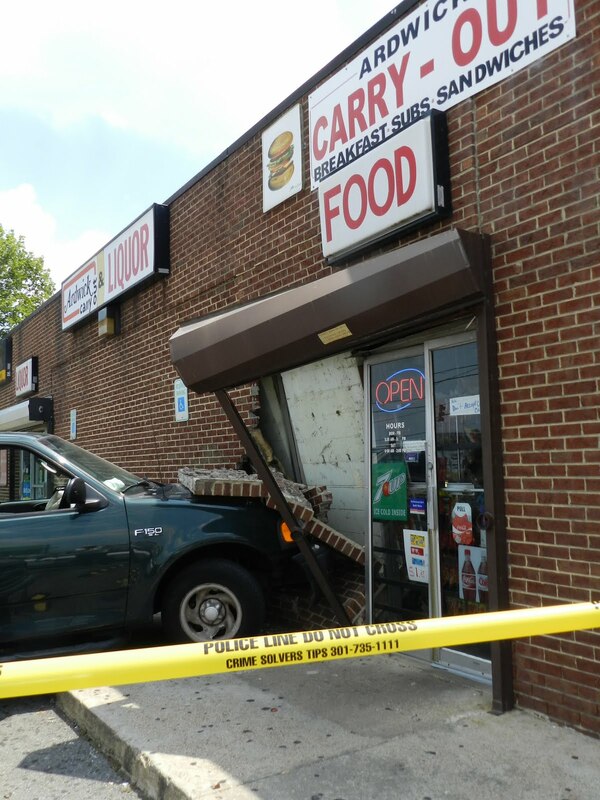 The vehicle jumped a concrete parking block and sidewalk before hitting the brick facade wall of a 1-story commercial establishment. The Ardwick Carry Out bore the brunt of the damage, however, both the carryout and the attached liquor store were closed until inspections and repairs are made. The stores are located in the 8300 block of Ardwick-Ardmore Road in Landover. In addition to Firefighters and Paramedics the Fire/EMS Department dispatched the Technical Rescue Team in the event of a collapse. The collision caused a large section of brick to crumble and the wall surrounding the impact area was bowed inwards. As a precaution, firefighters evacuated the two establishments and requested the assistance of a County Building Inspector to assess the damage and stability of the structure. Paramedics treated the adult female driver and transported her to an area hospital for a checkup of her medical episode and for any possible injuries sustained during the crash. No other injuries were reported and the County Police Department is investigating the incident. The National Weather Service is forecasting high heat and humidity for Prince George’s County this week. Heat indexes are likely to meet or exceed 100 degrees, especially, towards the end of the week. It is expected that unhealthy air will accompany the hot forecast creating a dangerous condition for sensitive groups and everyone that is outdoors. Heat exhaustion and heat stroke could be a threat if appropriate precautions are not heeded. Everyone is reminded to take precautions to stay safe and healthy. With high heat and humidity upon us in Prince George’s County the men and women of your Fire/EMS Department want you to stay informed and take precautions to stay safe and healthy. For every illness you prevent is one less response we need to make, help your firefighters and medics by staying safe and healthy. Temperatures in the nineties and higher, combined with high humidity may create a dangerous situation for everyone, especially; children, the elderly, and those who suffer from chronic heart or lung conditions. Your best protection is to stay in an air conditioned environment and stay well hydrated. Sweat, or water, allows heat to evaporate from your skin’s surface. If you become dehydrated, it is more difficult for your body to maintain an acceptable temperature. The best thing to drink is water and sports drinks are your next best option. Avoid drinks containing alcohol or caffeine. Limit heavy exertion when high levels of heat and humidity are present. High humidity levels make it more difficult for your body to dissipate heat. 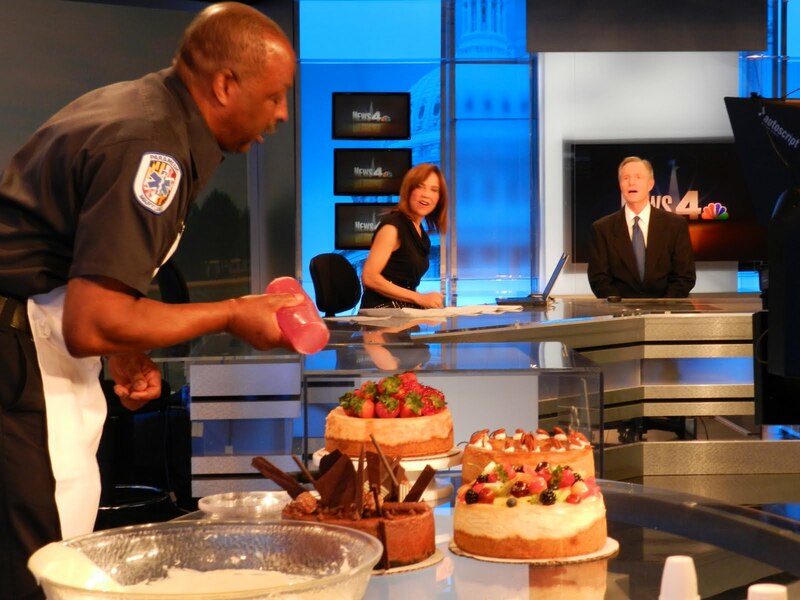 The top desert chef of the Prince George's County, MD, Fire/Emergency Medical Services (EMS) Department made an appearance on NBC 4 News this morning. 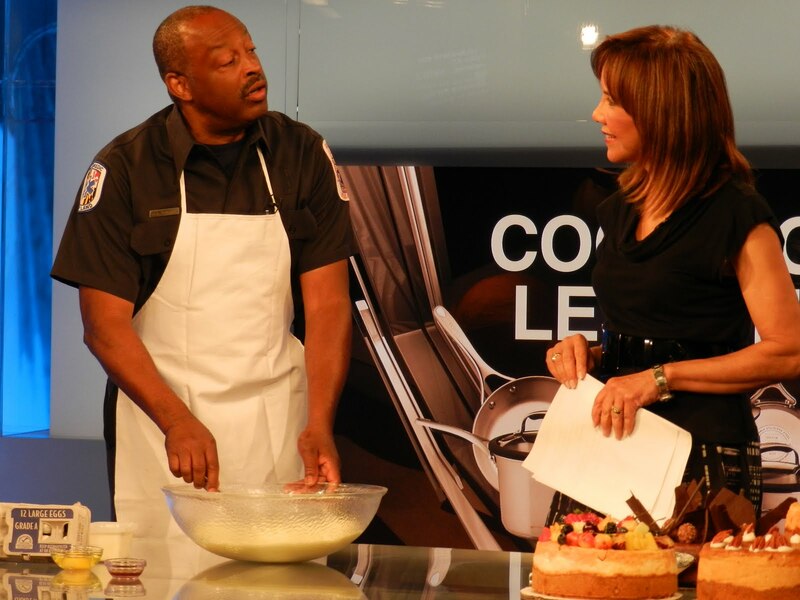 Fire Fighter/Medic John Scruggs, "Cheesecake Johnny," was asked to demonstrate his technique for baking the most wonderful cheesecake in town "live" on the set. 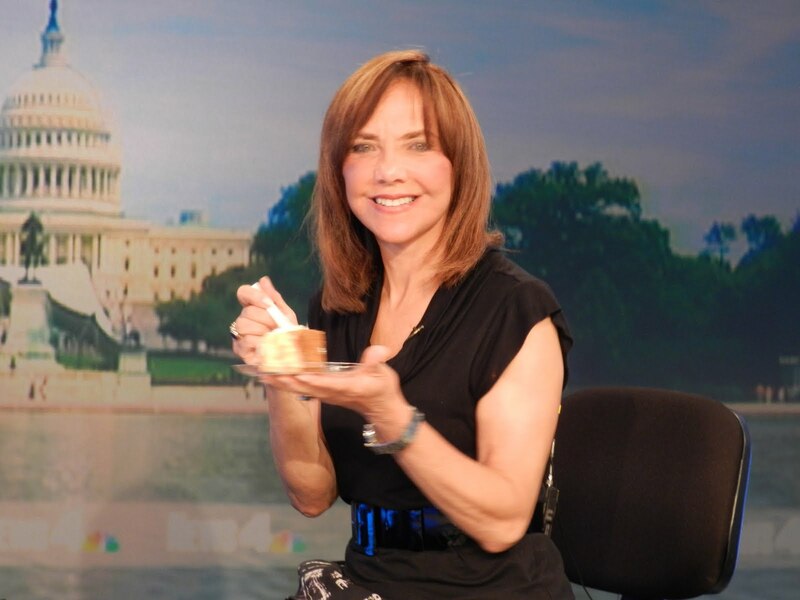 On Friday, July 15, 2011, Scruggs made the trip to the NBC Studio on Nebraska Avenue NW, Washington DC, and appeared in the 11:00 am newscast. 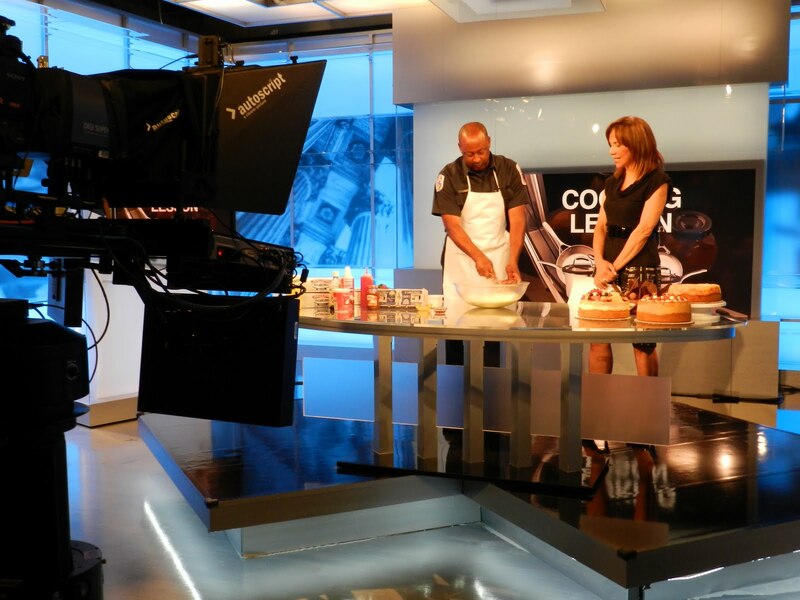 Despite a late start due to President Obama's news conference, Scruggs appeared with Anchor Barbara Harrison for a 5 minute segment. 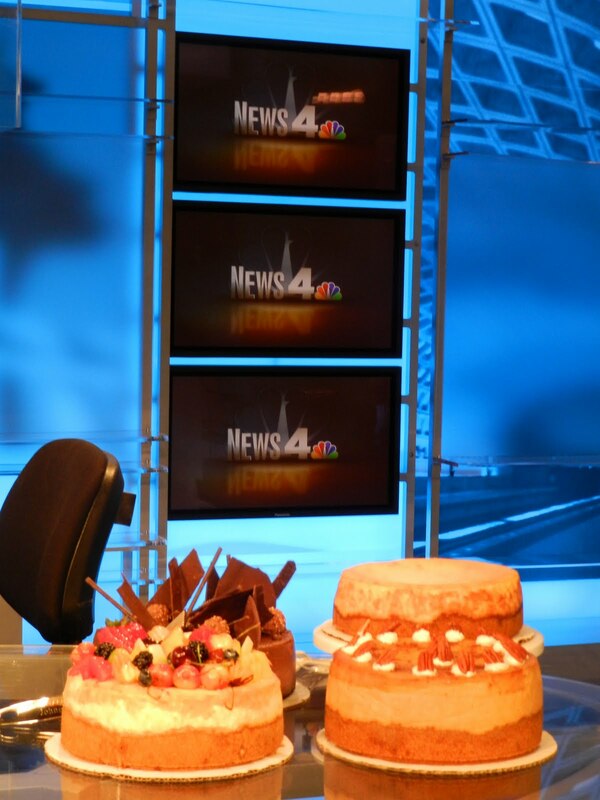 Anyone ever wonder what happens to the food items that are brought in for these newscasts? 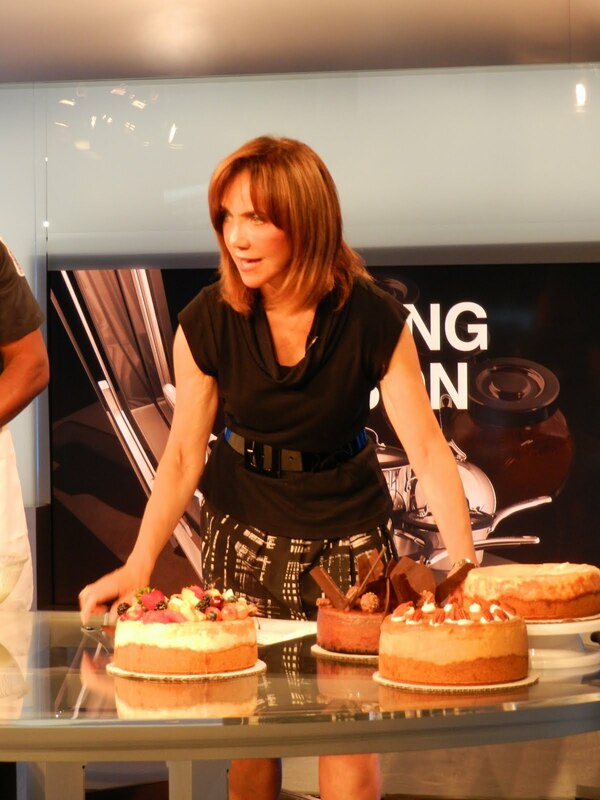 I can tell you there were no leftovers shortly after the show was complete. 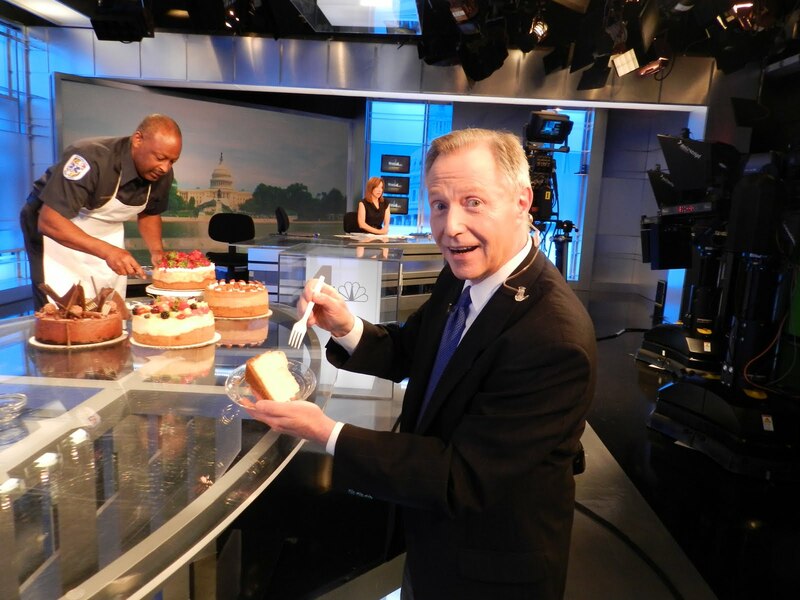 The anchors, production crew and newsroom all enjoyed a slice of cheesecake. 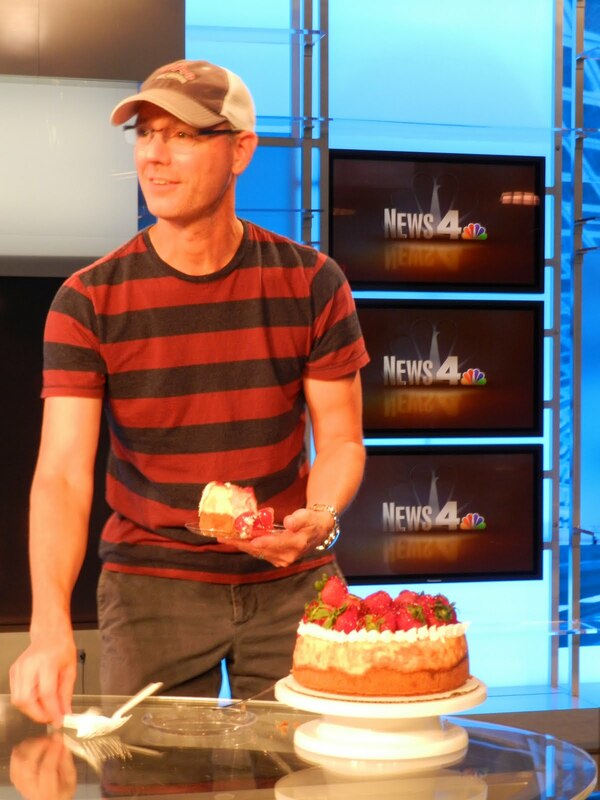 Overall, a great experience for a Firefighter/Medic that loves to cook and has a very tasty knack for cheesecakes. 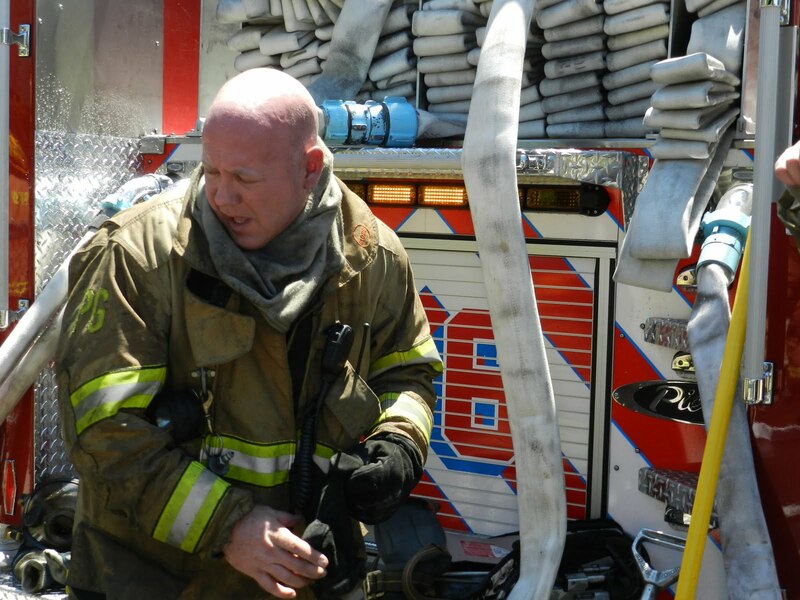 John Scruggs is a 17 year veteran Firefighter/Paramedic assigned to the Paramedic Ambulance at the Northview Community Fire/EMS Station in Bowie. Scruggs and his wife are residents of Bowie, MD. 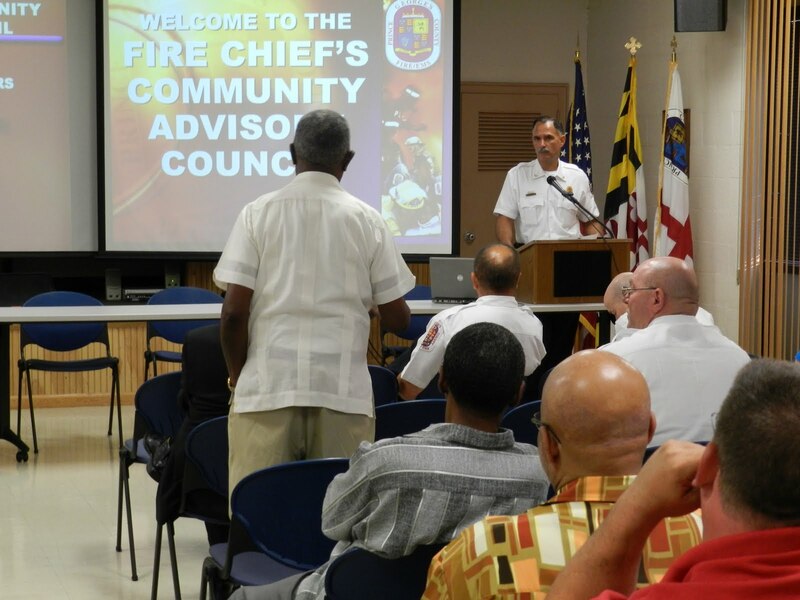 The inaugural Fire Chief’s Community Advisory Council (CAC) was convened on Wednesday evening, July 13, 2011. 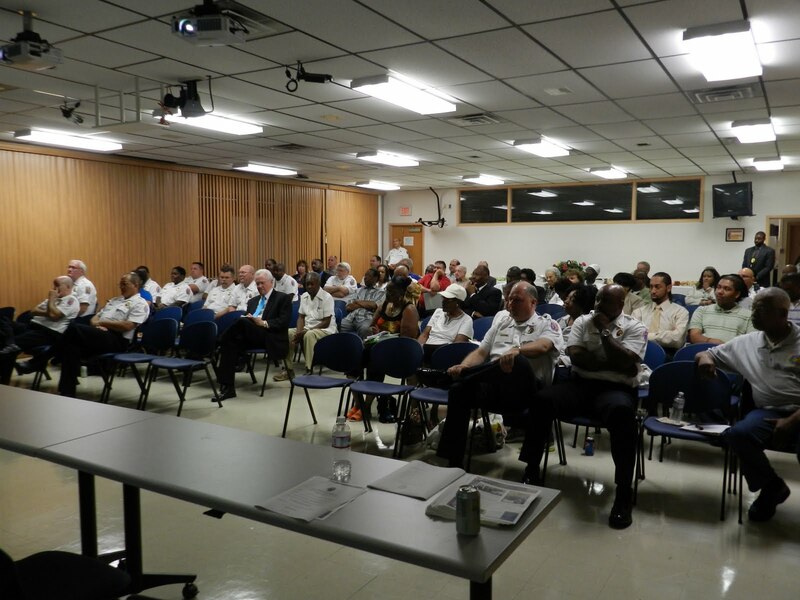 The meeting was held at the Fire/EMS Department’s Cranford-Graves Fire Services Building in Landover Hills and was attended by nearly 3 dozen members of the community. 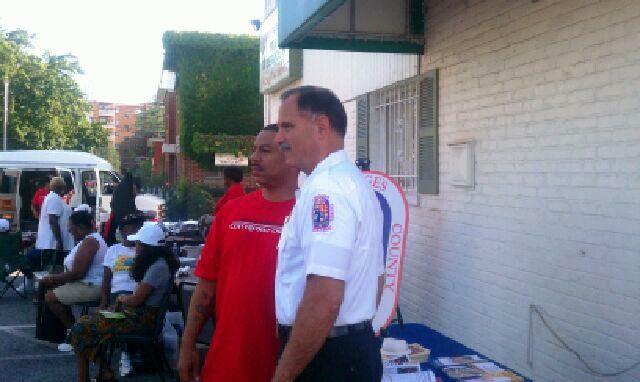 There were an equal number of Fire/EMS Department members in attendance as well. Council members Andrea Harrison and Eric Olson were in attendance as well as representatives from 2 additional council members and other elected officials. Fire Chief Marc Bashoor provided a recap of FIRESTORM 2011 which covered the events of February 19, 2011, when wind driven fires destroyed thousands of acres and over a dozen structures. 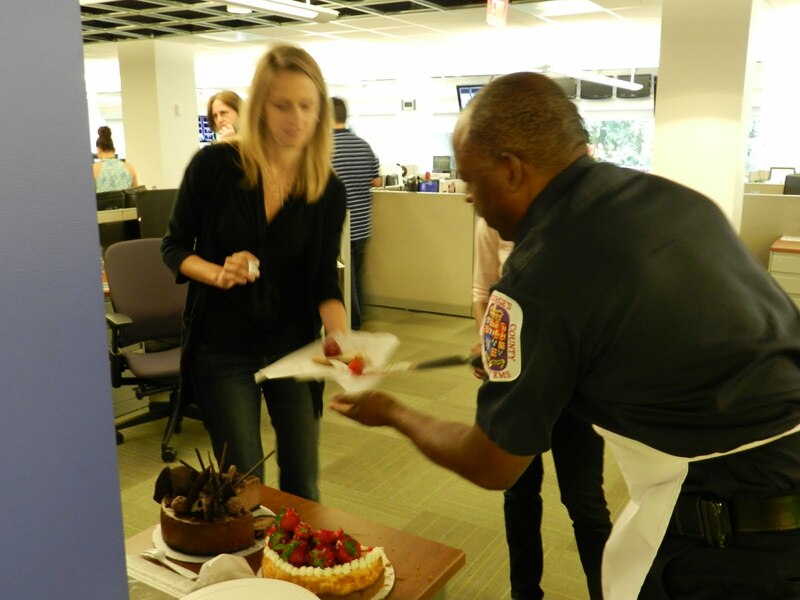 There was an overview of the Fire/EMS Department that included information on the number of career and volunteer personnel, services provided number of facilities and response statistics. Bashoor fielded questions from the community members about a variety of subjects including diversity and recruitment. 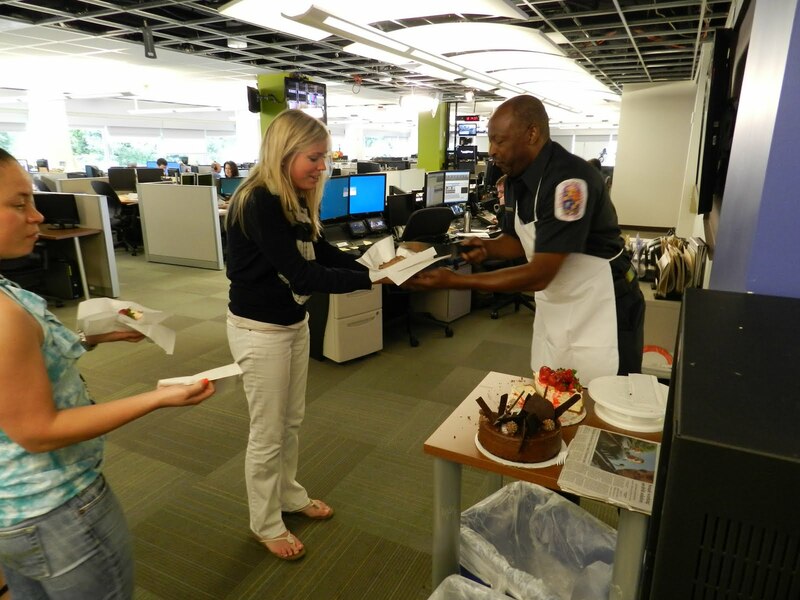 He received several offers of assistance from community members and invitations to municipal and town hall meetings. 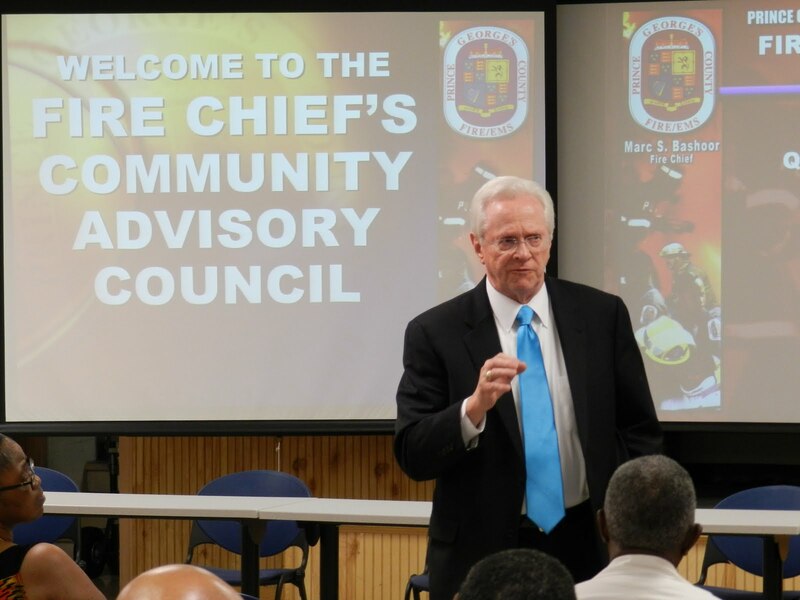 The Fire Chief’s CAC was formed to provide members of the community an opportunity to have direct dialogue with him and members of his management team to discuss issues important to their communities. 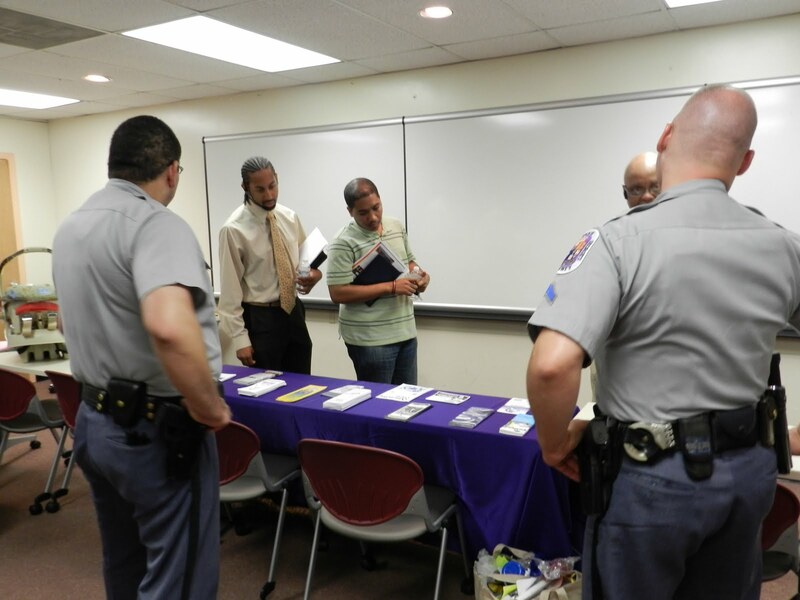 After the 90 minute meeting convened, members of the community were invited to a community outreach room where they were provided with an overview of services provided by various agencies of the County Government. The next CAC meeting date, time and location will be announced shortly. If you are interested in attending CAC meetings, please contact Ms. Diane Fennell, CAC Meeting Coordinator at 301-883-5200 or email at DMFennell@co.pg.md.us. 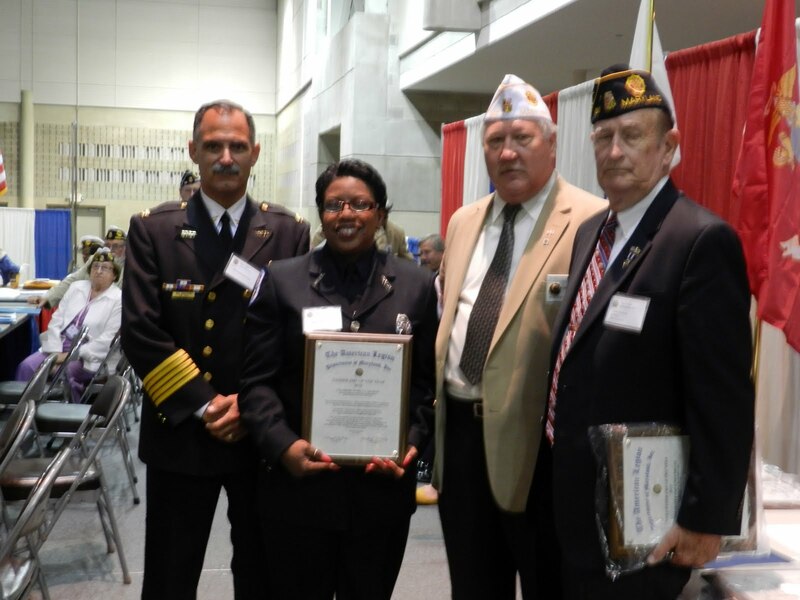 The Prince George’s County Council of the American Legion, Department of Maryland, Inc., had selected Paramedic Graham as their American Legion, Prince George’s County and the Southern Maryland District Council “2010 Career EMS of the Year.” Graham’s nomination was submitted to Department of Maryland for consideration as a statewide recipient as well. The award presentation was held in Ocean City, Maryland, on Thursday, July 14, 2011. Attending the award ceremony were Fire Chief Marc S. Bashoor, Major Dennis Neal, Paramedic Battalion Chief Mary Crampton, Public Information Officer Mark Brady and Fire Chief’s Aide Bill Hawkins. American Legions Public Safety Awards Chairman Bill Milligan, in making the presentation, stated, “Paramedic Graham was selected for her exceptional performance in 2010 when she was credited with 5 “saves” within a 3-month period. 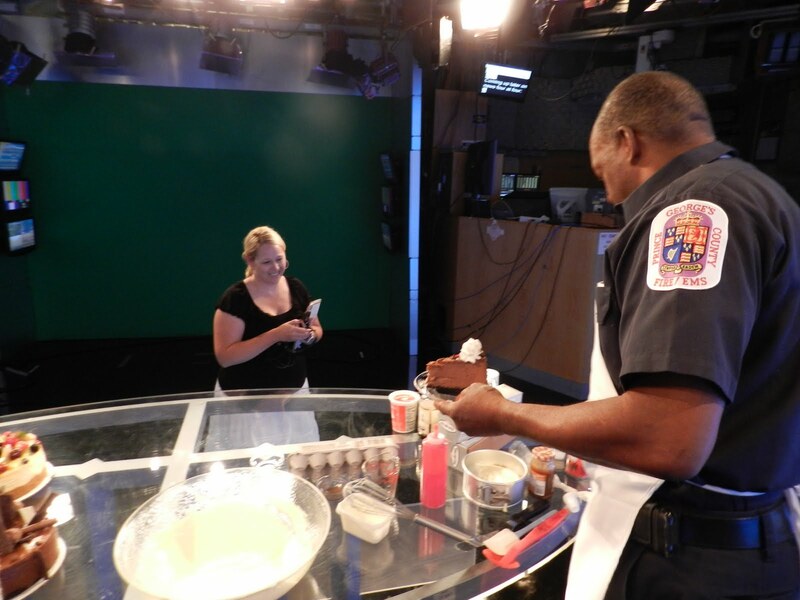 Pam is currently enrolled in higher learning college courses, as well as avid community involvement.” She is currently assigned to the Paramedic Unit at Clinton Fire/EMS Station #825. The Prince George’s County Council confirmed Marc S. Bashoor as the 11th person to serve as Fire Chief. The nine-member Council voted unanimously affirming the selection by County Executive Rushern L. Baker III who tapped Bashoor as the Acting Fire Chief in December 2010. 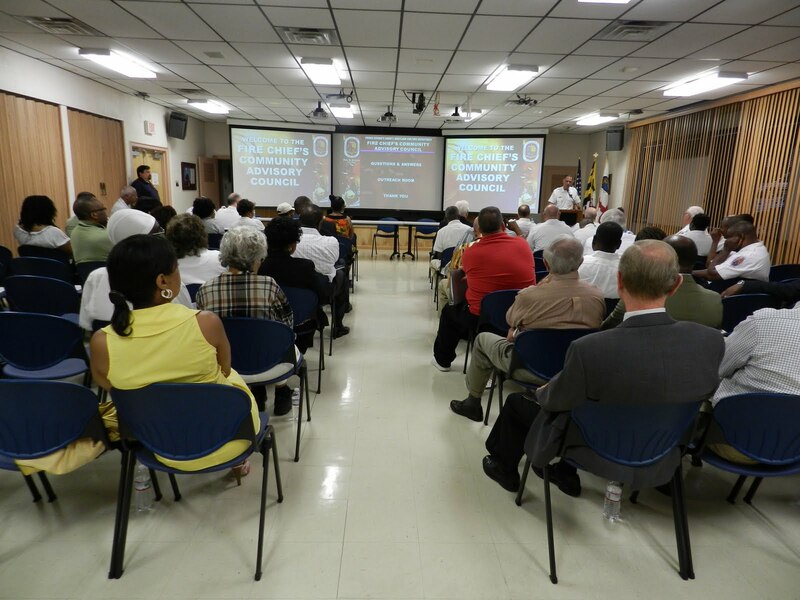 Dozens of career, civilian and volunteer members of the Fire/EMS Department attended today's confirmation hearing held in the Council Hearing Room in the County Administration Building in Upper Marlboro, Maryland. After the council hearing, Marc S. Bashoor took the Oath of Office administered by the Chief Deputy Clerk of the Circuit Court. His wife, Laura, and daughter, Nicole, accompanied Bashoor while taking the Oath. Nicole held the Bible for her father during the ceremony. After being sworn-in, Fire Chief Bashoor addressed the career and volunteer members of the Fire/EMS Department by stating, “The confirmation process culminated today with the County Council's unanimous affirmation of my nomination to be the County Fire Chief. I want to thank the County Executive and the County Council for their support and counsel through this 8-month-long process. His wife, Laura, and daughter, Nicole, accompanied Bashoor while taking the Oath. 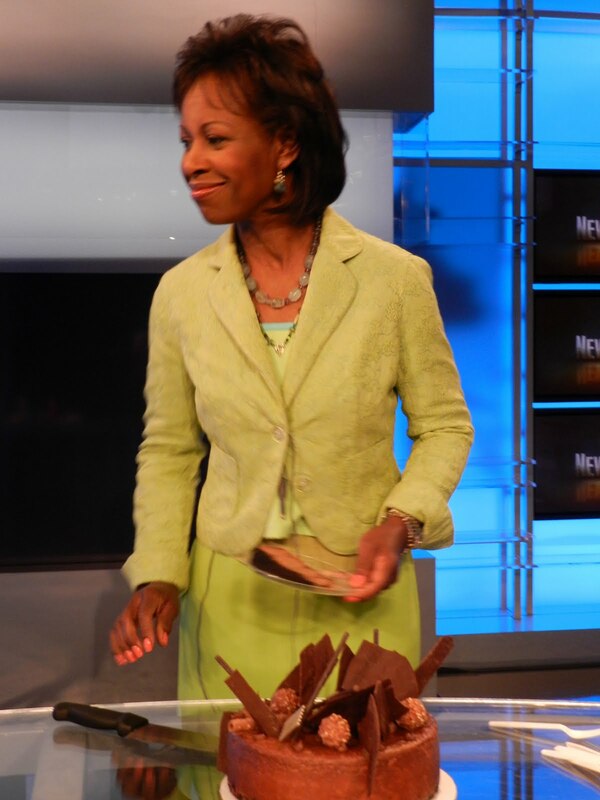 Nicole held the Bible for her father during the ceremony. No job is finished until the paperwork is complete. Fire Chief Bashoor signs documents swearing to his taking the Oath of Office. Fire Chief Bashoor addresses Council members as County Executive Baker looks on. Speaking on behalf of the Marc Bashoor was M.H. Jim Estepp. Mr. Estepp is a former County Fire Chief and Council member that now chairs the Prince George's County Business Roundtable. Mr. Howard Stone, an Administrative Specialist with the County, endorsed the selection of Bashoor as Fire Chief. The volunteer chief of the Morningside Volunteer Fire Department, Mike White, speaks of his stations endorsement of Bashoor as Fire Chief. The National Weather Service has issued a Flash Flood Watch for Prince George's County. Please read this valuable information and Stay Informed, Stay Ready, Stay Safe by keeping Safety First will ensure everyone goes home. BALTIMORE...PRINCE GEORGES...SOUTHERN BALTIMORE AND ST. MARYS. VIRGINIA...EASTERN PENDLETON AND WESTERN PENDLETON. TO DEVELOP EARLY THIS AFTERNOON...AND CONTINUE INTO THE EVENING. ACROSS THE SAME AREA...RESULTING IN FLASH FLOODING. 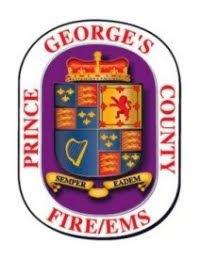 The combined volunteer and career men and women of your Prince George's County Fire/EMS Department want you to stay safe during this potentially dangerous weather conditions. Floods begin when soil and vegetation cannot absorb falling rain or melting snow, and when water runs off the land in such quantities that it cannot be carried away quickly enough in normal stream channels or cannot be retained in natural ponds and man-made reservoirs. Some floods develop slowly, sometimes over a period of days; however, flash floods can develop quickly within a few minutes or hours of heavy rainstorms or a dam or levee failure. It's important to be aware of flood hazards no matter where you live, but especially if you live in a low-lying area, in a densely populated area, near water or downstream from a dam. Flash floods occur within a few minutes or hours of excessive rainfall or a dam failure. Flooding is a longer-term event and may last a week or more. If your car stalls, leave it and seek higher ground, if you can do so safely. Stay informed about the storm and possible flooding by listening to your NOAA weather radio, commercial radio or television.